A Cruel Mountain: The Great Race, Bathurst 1000, 2014 | | A Wheel Thing. It’s now history that Chaz Mostert and Paul Morris won the Supercheap Autos Bathurst 1000 for 2014. It’s now history that they did so by, as silly as it may sound, leading on the last lap. Why that point is important is because it was the ONLY lap the car had been in the lead in the 161 laps the event has. However, the preceding near eight hours had seen scenes unprecedented in the history of V8 Supercars. In fact, the days leading up to The Great Race witnessed just how cruel “The Mountain” can be to drivers, both veterans and inexperienced. On most days of the year, the road is a tourist drive, limited to 60 kilometres per hour. It’s six thousand, two hundred and thirteen metres in length and has an elevation change of 171 metres from Pit Straight to the section called Skyline. It leads into a tight, twisty, steeply downhill inclined part of the circuit called The Dipper, which itself becomes the world famous Conrod Straight. However, this year, it was Griffins Bend or, innocuously, Turn 2, that saw most of the incidents that will entrench this year’s race in folklore. Practice on Saturady saw a mighty coming together of two cars, two drivers, two former team mates; Warren Luff had a brake system failure and, in an effort to wash of speed coming into the 120 degree uphill right hand turn, saw the rear of his car snap left, collecting the car of Lowndes and forcing both into the tyre barrier. The impact left the Luff vehicle on its side and the crowd witnessed the sportsmanship that we expect, with Lowndes sprinting back to his stricken friend, helping to extricate him from the car. 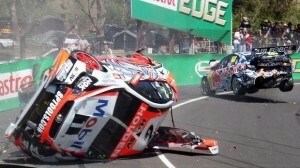 Luff’s co-driver, Garth Tander, a previous Bathurst 1000 winner, could only watch on and lament that the crash had left the car too badly damaged to be repaired in time. Lowndes, however, would go on to race the 888 Commodore with co-driver Steven Richards. The Porsche Carrera Cup saw their own share of carnage, with Michael Patrizi finding the wall on the second last lap of arace, with Nick Foster then having what could only be described as a brain explosion on the final lap, again at what would become the infamous Griffins Bend over the weekend. Diving down the inside of David Russell, Foster succeeded in taking out Russell, Warren Luff (suffering no ill effects from the V8 crash) and Steven Richards. Russell was able to continue, albeit at the end of the field. It was the Sunday, the race day, however, that showed just how cruel a mountain Mount Panorama can be. Chief amongst the moments that will be talked about is the red flag that put a pause on racing for an hour. The road surface had been relaid some months before and at Griffin’s Ben, yes, the very same, the surface was lifting, tearing and eventually seen to be potentially dangerous enough that it needed to be resealed. Controversy reigned as cars were worked on, out on the main straight, with the question being: “should this not have been a parc ferme’ situation?” Unfortunately for a member of the local wildlife, the Lockwood Racing entry of Fabian Coulthard and Luke Youlden happened to occupy the same space it wanted to be on, triggering a safety car. This led to the Dale Wood and Chris Pither Commodore ramming the rear of the Brad Jones Racing entry of Jason Bright and Andrew Jones. 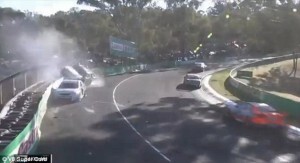 Crowd favourite Scott McLaughlin, in one of the two Garry Rogers Motorsport Volvos, took himself out of contention late in the race after clouting the wall at The Cutting on the way to Skyline, in almost exactly the same spot as team mate, Robert Dahlgren. Fellow Kiwi, Shane van Gisbergen, suffered heartbreak in pit laneafter the car stalled in a refuelling stop. Russell Ingall also had a brain explosion, trying the same inside move as Foster, coming into Griffins and having to brake late, hit the Erebus Mercedes of Lee Holdsworth, with both cars hitting the tyre barrier and Holdsworth’s car being lifted up and on its side before rolling onto the roof. The yellow Nissan of James Moffat and Taz Douglas had also hit the wall in the same spot earlier in the day, reentering the race with kilometres of race tape holding the front of the car together. Craig Lowndes was in the wars late in the race; coming into Hell Corner, turn one, Lowndes turned in and hit the rear of the 2013 champion, Mark Winterbottom. Somehow, miraculously, Frosty managed to hold the car on the track and, in a cloud of shredded rubber, continued although a few places down whilst Lowndes would be pinged and givin a drive through penalty. With just a couple of laps to go, the Red Bull Racing team were on the radio to Jamie Whincup, as he lead the race, telling him to nurse the car, watch the fuel. Whincup admitted after the race that he though he could do it. It’s history now that Whincup was wrong and the Mostert/Morris duo would win, coming from rear of grid and after their car had hit the tyre barrier with reasonable panel damage, to hold up, triumphantly, the coveted Peter Brock trophy. Douglas and Moffat would slide by Whincup for second position, as would Nick Percat and British driver, Oliver Gavin, for third. The Great Race lived up to its reputation on Sunday, October 12th, 2014, cruel in its majesty. Be the first to comment on "A Cruel Mountain: The Great Race, Bathurst 1000, 2014"